Sadhana: what is it and why does it matter? In the summer of 2016, I spent 40 days volunteering at an Kundalini Yoga ashram in the French countryside. Every morning before work I did 2.5 hours of Aquarian Sadhana, and every afternoon/evening on a break or after work I ended up by this river. I spent more hours than I can count sitting on the bridge over the waterfall pictured here. Those two daily practices moved me through one of the most difficult times of my life with so much more grace than I realized was possible. Sadhana means daily spiritual practice. Check out this article for more information. Four years ago, I was convinced that I didn’t have time to do anything for myself every single day. It felt impossible. At the time, I taught children with ASD and spent most of my professional life helping them change their behaviors using the principles of behavioral modification. I made it to exercise and yoga classes several times a week and told myself that was enough, that it should keep me in a centered and balanced place. A few months later, when I began my training in Kundalini Yoga, one of the requirements was that we complete a 40 day sadhana of at least 11 minutes/day. That, to me, felt completely overwhelming… how was I supposed to cram one more thing into my day?! My teachers encouraged me to take it slow, start with just 3 minutes a day of a practice that I absolutely loved. So I began chanting Ra Ma Da Sa every day for 3 minutes. Somewhere along the way, I realized that all my years helping my students make changes had prepared me perfectly to modify my own! So I embarked on a journey of self-study. I applied the principles of applied behavioral analysis to myself and taught myself to maintain a daily practice, bit by bit. I developed systems for rewarding myself (checking things off is so satisfying for me,) and began to feel the steadiness that sadhana imparts. Fast forward to today, and my daily practice is the cornerstone, and always at least 20 minutes, bare minimum. If I feel out of whack, and I take the time to recommit to (and sometimes repeat) my daily practice, it invariably helps me move back towards my center. One of my teachers said that he does his sadhana (daily practice) every day so that he can run his day, instead of his day running him. That line resonated deeply and stayed with me, and describes the reason that I prioritize my sadhana. Is it always easy? Do I have magical self-discipline powers? No and no. What I do have is nearly 4 years experience of proof that when I do my sadhana, my life flows more smoothly and I feel better. That’s what gets me to my practices every day. Is it perfect? Nope. There have been a couple days this year when I’ve missed on part or all of my sadhana. And the best thing I do when I flub up? I focus on being as supportive and kind to myself as I tried to be to my students when they invariably had a lapse. Instead of blaming and getting upset with myself, I tell myself that it’s ok, life isn’t perfect and neither am I, but I’m going to get back to it and start again. After all, sadhana is a practice, and so is life. All the re’s – Mercury Retrograde is here! When I feel off balance, the first place I go to reorganize my being is to my vibrational tools: my piano, my gongs, my Himalayan Singing Bowls. Chanting mantras, singing with my harmonium, diving into a specific meditation… all these tools help me to re-center, re-organize, and re-fill my personal well of energy. What techniques or tools are supporting you right now? 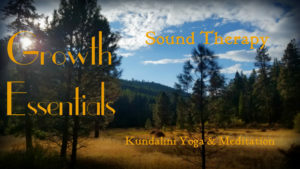 If you’re looking for some extra supports, check out the classes & events that are coming up – Full and New Moon Sound Baths, Gong Journeys, Sound & Meditation classes, and more. I’d love to see you soon! Moving into the year of mastery’s second month! I don’t know about you, but in my life this past 4 weeks has been full of travel, work, and some deep lessons. Moral of January 2018: self-care for me can take different forms (attending Kundalini yoga classes, sound healing experiences, hiking, relaxing at home, playing the piano/bowls/gong/harmonium, sitting for a quiet moment with some of my crystal allies, singing along to my favorite musicians on long drives) but the most important thing is to DO THE THING. The thing that will light me up. The thing that is easy to shove off to a later part of the day. The thing that reliably brings me back to my center. That may change from day to day, but connecting with my inner wisdom in the early morning always sheds light on what it is that my soul needs. In this time and space, when it can feel like the external world is overflowing with stress and pressures, remember that it is pressure that transforms a chunk of coal into a brilliant diamond. Many of these pressures may be far outside the realm of things we can impact, but we have a superpower: we always have the option of deciding how we respond to everything that comes into our lives. Stressors can enliven us and push us out of our comfort zone far enough that we exceed our own expectations and shine more brightly than last night’s super blue blood moon, or they can deflate and exhaust us. A tool that I am using to support myself in this journey is Spirit Voyage’s latest 40 day global sadhana. Today was the first of 40 days and the meditation just lit me up! Check it out here. Enjoy the beauty of this meditation and be kind to yourself as we shift into February. The bridge in this photo is at Château Anand, the 3HO ashram near Poitiers, France. In the summer of 2016 , I spent 40 days volunteering at the Château. Every morning I practiced Aquarian Sadhana, 2.5 hours of yoga and chanting. 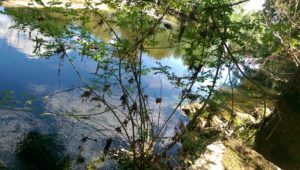 Every afternoon, by myself or with friends, I would go down to the river that borders one side of the Château, and spend time on the bridge. There were days when I would find myself on this bridge for hours at a time. Peering through the metal slats to the rushing water below, seeing the calmness of the water before it crashed down the rocks, listening to the sounds of passersby in their kayaks and canoes, writing, meditating, crying… that bridge was the space that held me as I faced what felt like an endless pit of darkness in myself. Dianne Reeves, an amazing singer, sang Sergio Mendes’ “Bridges” on the first album of hers that I was ever given. Her voice soared through my head…. 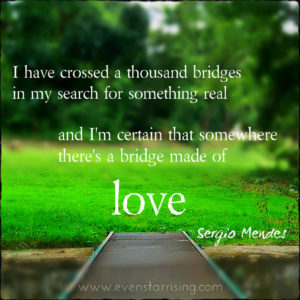 bridges made out of love. What would that look like? What would it feel like? At Château Anand, it looked like an old, solid metal grating going across a small waterfall, and it felt like the patterns that formed on my legs and backs of my thighs as I sat there, cross-legged, writing everything out, crying all the tears I’d suppressed, feeling everything that I’d tried to keep myself from feeling. The small red lines on my legs always faded away, as did the intensity of my emotional agony. 40 days after I first arrived at the Château, an old friend picked me up. We walked down to the river, and I showed him the bridge. To him, it was a simple metal bridge. To me, it was everything. It was the place where I’d spent enough time looking into the dark to see the light glimmering in the shadows. It was the home of my new self, the woman who honors her inner knowing. It was, and is a sacred space. A space that I revisit when I close my eyes, and the safe, comforting feeling of sitting on that bridge stays with me. One day, I will return. 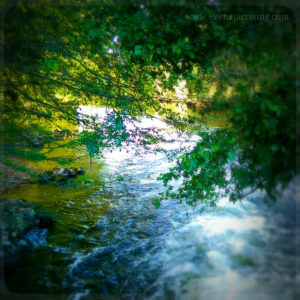 I will go visit “my” river, “my” bridge: the place that gave myself to me. Until then, this simple bridge over the healing river at Château Anand stays with me. May each of us find our bridge. Metal, wooden, whatever its physical makeup is or is not, may it be a bridge made out of love. These words have been special medicine for me during the transition from 2016 to 2017. It has been a time of change, of upheaval, and emotions have been running high. 2+0+1+6=9. From the standpoint of numerology, the number 9 is the end of a cycle. The last number before the cycle begins again with 10, an amplified return to the beginning, to 1. Shifting from the 9 year of 2016 to a 10 or 1 year (2+0+1+7) is the transition from the end to the beginning. Planting seeds that will take root, bloom, and mature over the next 9 years. For me, the seeds sown over the last several weeks are showing vibrant signs of life. In a dark time, training my focus on keeping my light aflame and bright has held me up. And now, it feels brighter and stronger than it was. The tools that I used to keep myself steady in the darkness, to shield my light that was flickering weakly? My sadhana, my daily practice. For me, chanting Japji, practicing the Kriya to Keep the Body Beautiful, and keeping up with the Spirit Voyage Global Sadhana Oneness of Heart held me up through the rough and tumble ending of 2016. Now here we are, in 2017, beginning again. The end is the beginning of the new, and it leads to another ending. So the wheel turns. 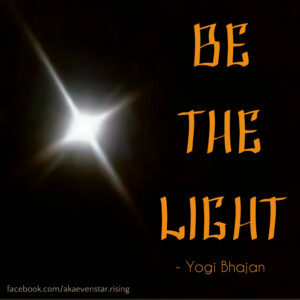 May all of our lights shine ever more brightly as we plant seeds into the darkness of the earth.